southeasterly direction to a southwesterly direction behind the front. This shift is not as pronounced as with the cold front. Temperature generally is constant or slowly rising in advance of the front until the surface front passes, at which time there is a marked rise. This rise is dependent upon the contrast between the air masses. Dew point usually increases slowly with the approach of the front with a rapid increase in precipitation and fog areas. If the warm sector air is maritime tropical, the dew point shows a further increase. 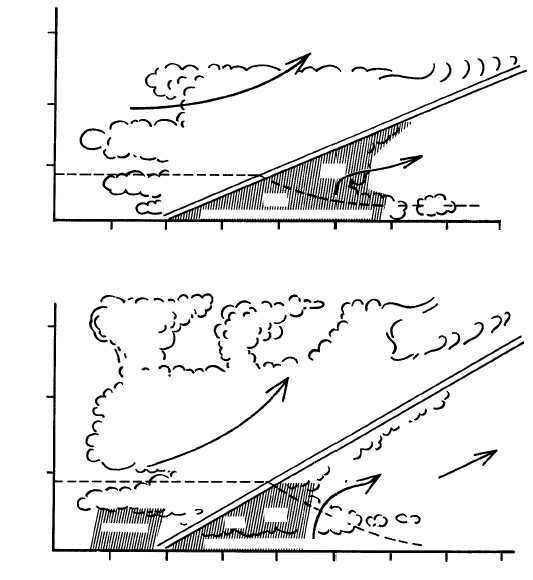 WEATHER A characteristic phenomenon of a typical warm front is the sequence of cloud formations (fig. 4-36). They are noticeable in the following order: cirrus, cirrostratus, altostratus, nimbostratus, and stratus. The cirrus clouds may appear 700 to 1,000 miles or more ahead of the surface front, followed by cirrostratus clouds about 600 miles ahead of the surface front and altostratus about 500 miles ahead of the surface front. Precipitation in the form of continuous or intermittent rain, snow, or drizzle is frequent as far as 300 miles in advance of the surface front. Surface precipitation is associated with the nimbostratus in the warm air above the frontal surface and with stratus in the cold air. However, when the warm air is convectively unstable, showers and thunderstorms may occur in addition to the steady precipitation. This is especially true with a cyclonic flow aloft over the warm front. Fog is common in the cold air ahead of a warm front. 4-38 AG5f0436 STABLE WARM AIR 30,000 20,000 10,000 SFC 0 C O S C N S A S C S C I A S S T F O G , R A I N A N D L O W N I M B O S T R A T U S 200 100 0 100 200 300 400 500 600 SC SC 0 C O C I C S A S N S C B UNSTABLE WARM AIR 30,000 20,000 10,000 SFC 0 C O 200 100 0 100 200 300 400 500 600 L I G H T R A I N A N D S H O W E R S N S S T S H O W E R S A C A S SC 0 C O Figure 4-36.Vertical cross section of a warm front with stable and unstable air.